3.8 out of 5 based on 88 bloggers and 16 commenters. 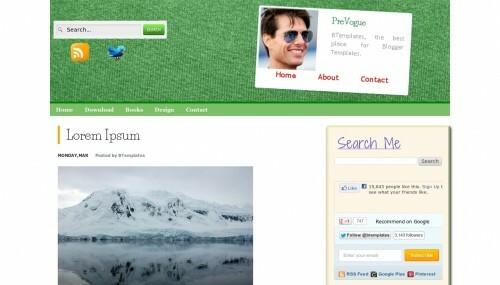 PreVogue is a free blogger template with 2 columns, right sidebar, an exclusive design for Blogger, footer columns and social bookmarking icons. wow great< but how to chance photo on the wall ?? Nice template. i love it. thanks admin…. Trying to change the picture in the header — don’t want Tom Cruise, but my own logo. How do I do that? I’ve been looking for a jpg in the html but don’t see one. god job vry gd tamplt..
this is a vry nice site.